Magazine says Guzman Loera "one of the biggest suppliers of cocaine to the U.S."
MEXICO CITY, Mexico (CNN) -- What do software mogul Bill Gates and banking investor Warren Buffett have in common with wanted Mexican drug lord Joaquin "El Chapo" Guzman Loera? 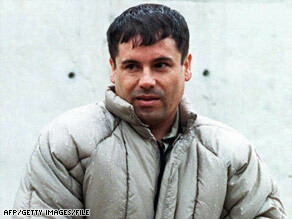 Joaquin "El Chapo" Guzman Loera, pictured in 1993, ranks 701st on Forbes' yearly report on billionaires. They are all featured in Forbes magazine's world's billionaires report as "self-made" billionaires. Guzman Loera, whose nickname means Shorty, escaped from a Mexican prison in 2001. He heads the powerful Sinaloa cartel, investigators say. Authorities on both sides of the U.S.-Mexico border blame the Sinaloa and other cartels for a surge in violence in the region. He ranked 701st on Forbes' yearly report, with an estimated fortune of $1 billion. Mexican Attorney General Eduardo Medina Mora expressed outrage at the publication and described Forbes' calculations on Guzman Loera's fortune as mere "speculation." "I will never accept that a criminal could be recognized as someone distinguished, even if it is by a magazine like Forbes," Medina Mora said to local media during a drug traffic summit Thursday in Vienna, Austria. Forbes is "comparing the deplorable activity of a criminal wanted in Mexico and abroad with that of honest businessmen," he said. Mexican President Felipe Calderon -- speaking at a business summit Thursday in Mexico City -- alluded to the report, saying, "It is very sad the intensification of a campaign, which seems to me, has been launched against Mexico." Calderon added, "Public opinion and now even magazines not only attack and lie about the situation in Mexico, but now also praise criminals. In Mexico, it is considered a crime to praise criminals." Guzman Loera has a three-decade history of drug trade spanning North, Central and South America. The Forbes profile of Guzman Loera reported that "the U.S. government is offering a $5 million reward" for the billionaire's capture. Steve Forbes, the magazine's editor-in-chief, issued a statement on Saturday saying "it is deplorable that someone like this has a billion dollars." But the magazine, he said, was simply doing its job and reporting a fact. "Forbes has listed other criminals from Meyer Lansky (1982) to Pablo Escobar (1987-1993) on our Rich Lists," Forbes said. "Don't shoot the messenger." Its article offers a rationale as to why Guzman Loera made the list. "So is there anywhere one can still make a fortune these days? The 38 newcomers offer a few clues. Among the more notable new billionaires are Mexican Joaquin Guzman Loera, one of the biggest suppliers of cocaine to the U.S."
CNN's Mayra Cuevas contributed to this report.